Logan Babin Real Estate is pleased to announce the closing of another large acreage property today near the U.S. Highway 90 Energy Corridor. This 85+ acre tract closed for a price of $3 million. 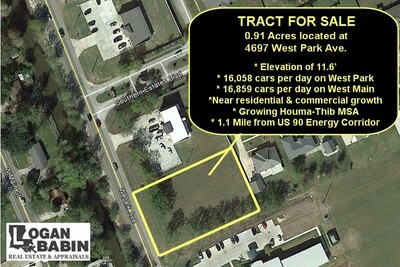 The tract, listed and sold by Logan “Hank” Babin, III, was a rural residence and farm but sold for its development potential. The family enlisted our firm’s help after marketing the property on their own. There was immediate interest from the moment it was input into our various databases and the property went under contract in January 2015, not long after it was marketed. 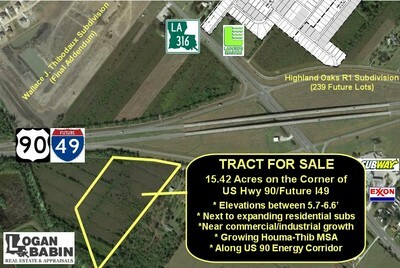 The tract was located just north of Houma with direct access to US Highway 90/Future I-49, “America’s Energy Corridor”, on LA Highway 311. And there are plans to extend Valhi Blvd. 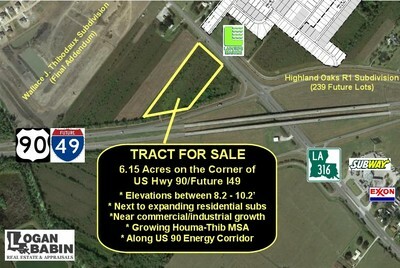 from Houma to US Highway 90 through the rear portion of the tract. Local real estate news has continued to be positive. Schlumberger, an oilfield services giant, recently purchased 60 Acres at US Hwy 90 and LA Hwy 311 for $4.5 Million. And our firm had January closings on commercial/industrial acreage at the corner of LA Hwy 182 and Coteau Rd. plus additional land for international propulsion firm Schottel. Besides these closings, 90 acres on LA Hwy 311 just south of US Hwy 90 went under contract in January. The coming months will be an interesting time in our industry and for the overall economic health and future of South Louisiana. If you need real estate advice and guidance to help you navigate these turbulent times, contact Logan Babin Real Estate and Appraisals. We have been offering sound, competent real estate advice and counseling for over 50 years. Call us today and you will soon discover why we say – Logan Babin Real Estate & Appraisals – Local Knowledge…National Reputation! Logan Babin Real Estate was blessed once again with a very productive year in 2014. According to final statistics provided by the Bayou Board of REALTORS and their 2014 Office Ranking Report, Logan Babin Real Estate was involved in 23 transactions totaling $16,221,700.00. Our office was #1 in the Bayou Board of REALTORS with an average of $705,291.00 per transaction. This transaction average is 2.25 times larger than the next closest office and four times greater than the entire area’s 2014 average of $171,864.00 per transaction. The past two years have been very productive with 2013-2014 totals of 45 transactions of $31,476,700.00. This is a two year average of $699,350.00 per transaction, all recorded by Logan “Hank” Babin, III. With a primary focus of serving the commercial and industrial real estate markets in South Louisiana, Logan Babin Real Estate strives to provide excellent guidance and unmatched knowledge of the factors that determine value. This combination serves to the benefit of our client base with proven financial results. We would like to thank all of our clients who placed their trust and confidence in our office to assist them in these important financial matters. With the market very cautious about oil prices and the impact on our local economy, it is critical to retain the services of a firm with experience, knowledge, and integrity. Logan Babin Real Estate is pleased to announce the closing of another commercial property today. Four commercial/industrial tracts on the corner of LA Hwy 182 and Coteau Road closed for a combined price of $1.1 million. The tracts, listed by Logan “Hank” Babin, III, were owned by a family with members both in and out of Louisiana. The family enlisted our firm’s help to devise a plan how best to divide and market their property. After months of working with local surveyors, engineers, and the Planning Commission, the larger tract was subdivided into five smaller tracts, with the family retaining a large, wooded area while the remaining four tracts (totaling over 43 acres) were listed in late October 2014. The property generated immediate interest with numerous inquiries and multiple offers presented within the first few weeks of the listing. The tracts were centrally located just north of Houma with direct access to US Highway 90/Future I-49, “America’s Energy Corridor”, from LA Hwy 182 and also Coteau Road to LA Hwy 24. A new hotel is coming to East Houma and Logan Babin Real Estate is proud to have brokered the deal by bringing the developer and land owner together. Cajun Lodging, LLC, which operates multiple hotels across South Louisiana, purchased 2.3 acres off of Grand Caillou Road near the East Houma Wal-Mart for their fourth hotel in Terrebonne Parish, a Holiday Inn Express. After evaluating multiple potential locations, the developers zeroed in on the site which satisfied all of their requirements. The location gives them plenty of visibility from Grand Caillou, has multiple options for ingress and egress, and has full utilities. The sellers also decided to entrust Hank Babin to list a 1.5 Acre pad site directly in front of the future hotel. This site was also recently purchased for the future location of a restaurant. Cajun Lodging currently operates three hotels in Houma (the Holiday Inn on Martin Luther King Blvd., the Best Western at the corner of US Hwy. 90 and LA Hwy. 24, and the recently opened Candlewood Suites extended stay on Corporate Dr. This new site is scheduled to be home to a Holiday Inn Express. If you are looking for property in East Houma or anywhere else in South Louisiana, contact us and see why we say: Logan Babin Real Estate – Local Knowledge. National Reputation. 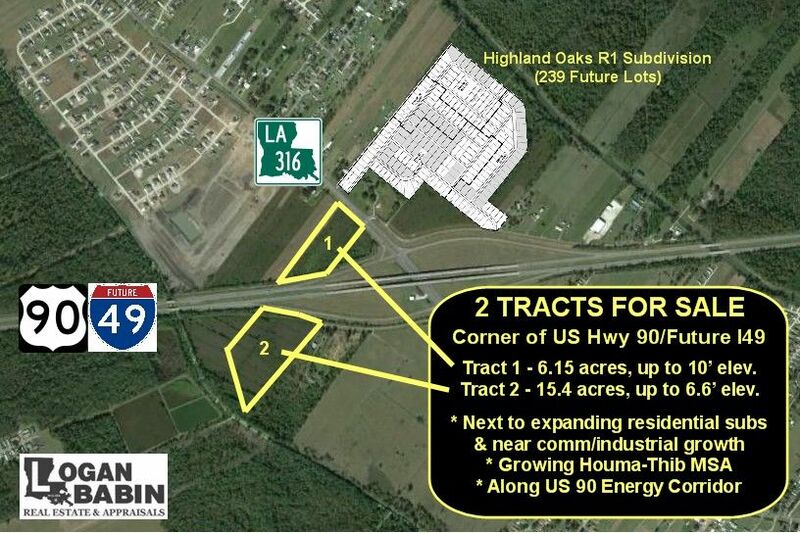 If you are looking to buy or sell property along Highway 90 (Future I-49), contact our team at Logan Babin Real Estate. This area is part of an important energy corridor between Port Fourchon and Lafayette. And we have the experience to either find the right location for you or market your property to sell. Contact us today and you will see how our knowledge of the Hwy 90 area can benefit you, whether you are buying or selling. And then you will know why we say: Logan Babin Real Estate – Local Knowledge. National Reputation. For the second time this year, Logan Babin Real Estate and Hank Babin have brokered a 7-digit transaction on the corner of US Highway 90 and LA Highway 316. Today, Highland Oaks Commercial, LLC sold 12.7 acres of property to Labmar Properties, LLC for $1,750,000.00 for a future office of Laborde Marine and possible other potential commercial development. In April of this year, Logan Babin Real Estate brokered the sale of the same property as part of a larger transaction of 83+ acres of development land and 300+ acres of accessory use land. That property was subdivided by the buyers for the future development of single-family residential housing as well as 12.7 acres for commercial development.